Heston Blumenthal’s passion for food was kindled in 1982 when, at the age of 16, he went on a family holiday to Provence and experienced the delights of a three star restaurant. He started to experiment in the kitchen as a teenager and as a young adult spent his holidays on gastronomic pilgrimages crisscrossing France. This formed Heston’s culinary apprenticeship. Apart from three weeks in a couple of professional kitchens, he is entirely self-taught. It took him more than a decade to realise his dream of becoming a chef. By day he worked in a variety of jobs – photocopier salesman, debt collector, credit controller – while at night he worked his way through the classical repertoire of French cuisine, perfecting his techniques and working on ways to capture flavours, textures and aromas. In 1995, aged 29, he opened The Fat Duck in Bray and word spread fast. It is now regularly booked solid and has received ecstatic reviews and guide book recommendations. The Good Food Guide awards it nine points out of a possible ten and says: 'the sensual food is like early Picasso, in that it breaks moulds, and crosses boundaries, while tasting utterly delectable'. Only two other chefs scored higher: Marco Pierre White and Nico Ladenis. The Michelin Guide awarded The Fat Duck its first star in 1999, which was retained in 2000 and 2001 and he has been awarded a second star in 2002. He has recently opened the Riverside Brasserie also in Bray. Heston is the first winner of the new "Chef of the Year" award in the 2001 Good Food Guide, and The Fat Duck has been made the AA Restaurant of the Year. Heston's style marries the French bourgeois tradition with an experimentation born of boundless curiosity and the gastronomic equivalent of perfect pitch. His combinations are legendary – snail porridge, cod with cockscombs and liquorice, foie gras with marinated salmon, and cuttlefish cannelloni of duck and maple syrup. His recipes can be seen regularly in the Guardian on Saturdays. His first book ‘Family Food’ was published by Penguin in 2002, and he has since gone on to publish a further 7 books. 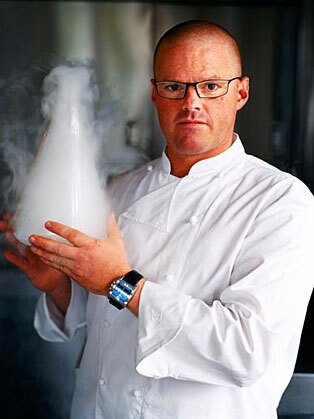 Heston has also filmed his own TV series ‘Kitchen Chemistry’, which aired on the Discovery Channel. This series looked at the latest scientific research on food. He has been profiled by a number of publications including Caterer & Hotelkeeper and The Independent. BBC Radio 4 broadcast ‘Kitchen Cornucopia’, a three part series presented by Heston.